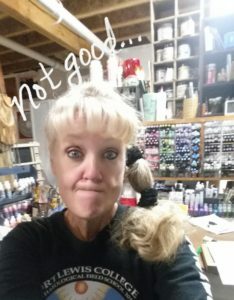 Home » Dear Alcohol Ink Artists–this is a serious concern you need to know about! 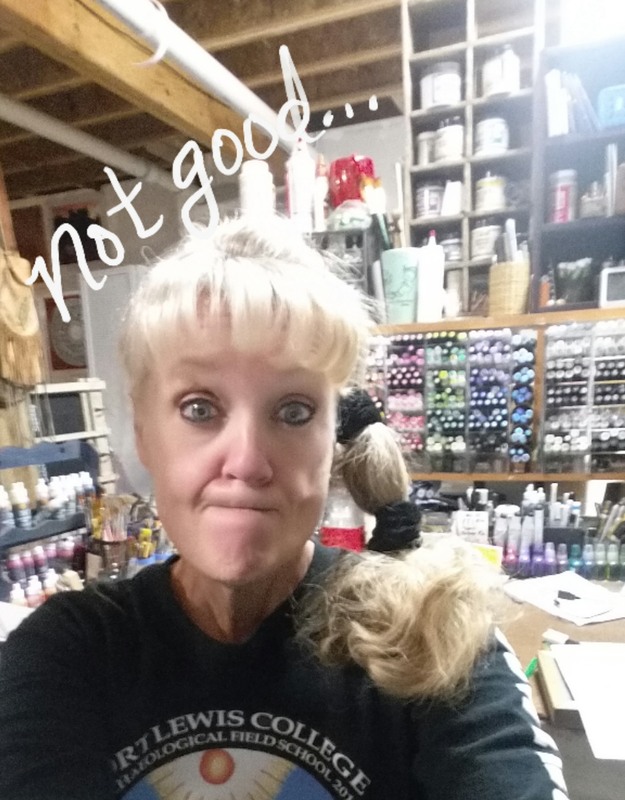 Dear Alcohol Ink Artists–this is a serious concern you need to know about! As an alcohol ink artist, I made an alarming discovery that I think all of you need to know. I recently purchased an Air Quality Monitor. This is the one I chose, and it measures in mg, so for comparison sake, you turn it to mcg. There are many other good ones. I’m going to purchase a second one that is totally different, and compare. I suspect I’ll get similar results. Why did I purchase the monitor? Because my art studio is in our basement and I wanted to see how clean (or not) the air was in the basement. I do use a Germ Guardian air purifier that sits not 2 1/2 feet from me, blowing right on me. I also use two Air Oasis air purifiers which work differently than the Germ Guardian—they have small amounts of ozone, and air does not blow through them. But I only turn them on when we are gone.. This is a measurement of the formaldehyde level in the area you are in, and is considered a Volatile Organic Acid, aka VOC. . Formaldehyde is common in many homes, coming from things like your water heater (mine is in the basement where my studio is), furnace or fireplace, cleaning products with terpenes, plywood, pressed wood, particle board, medium density fiberboard, many cosmetic or body products,some clothing, some curtains, perhaps a new couch or rug, cigarettes or ecigs…on and on. You can read more here. But the BOTTOM LINE is that formaldehyde poses a “significant danger” to all of us with its common release in our private homes. Ideally, you want the HCHO to be less than or equal to .10 and the TOVC less than or equal to .6. I then did an experiment that HIGHLY concerned me and should YOU. When I got Mild Pollute in my basement studio, I set the monitor to my left with a smile, and started to use Ranger Adirondack Blending Solution on my Yupo. Within 2 seconds, my monitor emitted an alarm. I looked over…and the HCHO (formaldehyde) shot up to 1.999 (the highest it can go) and the TVOC (gas emitting toxic chemicals) shot up to 9.999 (the highest it can go)…and it said in red SERIOUS POLLUTE. I was shocked. The third ingredient is the alcohol! The same alcohol we use to spray our Yupo or tiles, the same alcohol we use to clean our brushes, the same alcohol in the inks, the same alcohol in the pens. So….I decided to JUST test the 70% alcohol that I have on hand (less alcohol than the 90% I have on hand). I sprayed the Yupo…and BAM…the measurements did the exact same thing–as high as they could get, and SERIOUS POLLUTE. See https://www.ncbi.nlm.nih.gov/pubmed/1521838 And there are many more research articles about the toxicity of the alcohol we use. Now my experience may not not be yours. BUT it could for “some” of you. And it definitely could the longer you expose yourself to these toxicants by using your alcohol inks a lot, as I do. I started using alcohol ink in March of 2016. And though I didn’t connect it, I was having a lot of problems over the next few months. One was lack of oxygen–I would just get breathless climbing stairs. And I would run out of gas VERY easily if I tried to do much, which would take me four days to recover. Also, I was having word recall problems, and a test I did revealed I had brain inflammation. By October of 2016, I contacted a doctor friend of mine who ordered some very different kind of tests (that’s a different story which I’m not going to go into here). I had MAJOR inflammation, i.e Chronic Inflammatory Response Syndrome–the same issue some get with exposure to mold. With my labs, I also had what is called hypoperfusion–my capillaries have not been getting oxygen to my mitochondria well, thus breathlessness and easy fatigue. All this was caused by me being exposed to a biotoxin. At first, I thought that biotoxin was mold in the basement. I did a test by Mycometrics last February, and my basement was a bit too high with mold. But I knew where the mold were coming from–very old family oil paintings that I had on the walls. Those frames are what I had primarily wiped a test cloth on. So I removed them. I got the GermGuardian and the Air Oasis. I also did key steps in getting well again, developed by a Dr. named Shoemaker. But…I wasn’t getting well…and I couldn’t figure out why. THEN IT HIT ME when I used this Air Quality Monitor–my inflammation, hypoperfusion, and other issues were most likely the result of me breathing in the alcohol ink, and perhaps the Ethanol. I had been poisoning myself!!! Now again, my experience may not be yours. But it underscores that ALL OF YOU, if you are not consistently using a quality vapor mask each and every time you use alcohol, alcohol ink, the blending solution and the pens, you are being exposed to toxic chemicals. And they just might harm you long term as they have me short-term. But I’ll let you decide. I need to wear a vapor mask all the time I’m doing alcohol ink painting. And I’m thinking of adding one more air filter machine in my studio. And something that has dawned on me�to put a small fan to blow right where I’m using alcohol ink, alcohol itself, and the blending solution!! It can blow away from me and towards the room filters I’m using. And because of the damage they have done to me, I’m using 4 Activated Charcoal capsules every night to remove any lingering chemicals from my body. There are several brands on Amazon, for example. Here’s on that outright says it’s for vapors, has good ratings and is cheap. https://smile.amazon.com/gp/product/B007JZ1P8A/ref=oh_aui_detailpage_o00_s00?ie=UTF8&psc=1. I have this one by 3M–they make great masks, and it’s cheap, and I like the pink. lol. The information states it’s for vapors, but it’s not as pronounced as a focus as #1 and 2. I’m going to try it out and see. Keep in mind that the goal, when using the air quality monitor, is to find your rooms or house with an HCHO less than or equal to .10….TOVC less than or equal to .6–. So I did another experiment in my studio–this is NOT about using alcohol ink, but whether the studio in the basement as a whole is good. The Germ Guardian was not on, but the Air Oasis had been on all night. I first tested the air quality by my studio table and got the same MILD POLLUTE with the HCHO at .08 (formaldehyde and which fits the above goal) and the TVOC at .402 (gas emitting chemicals and which fits the above goal). I then turned on the Germ Guardian Hepa Air filter, which was just over 2 1/2′ away, and left it on for five minutes. The new reading was virtually the same, but now had the green GOOD AIR. Weird. I did conclude that:either the Germ Guardian is doing nothing, or I need to change the filter, OR it’s done a fine job with the Air Oasis in creating a stable environment whether off all night, or on. Who knows. Several hours later, after the Germ Guardian was still on, I did a 3rd experiment. This time, the HCHO was now less than earlier at .0201 (formaldehyde) but the TVOC was now higher at 1.003 (gas emitting chemicals) and did not qualify for the above goal…but still a MILD POLLUTE. I also tested COPIC REFILLS. Note that my studio measurement this time was this: HCHO (formaldehyde) was .088 and TVOC (mixed Volatile Organic Compounds) was 0.435….and GOOD AIR. I also tested Copic pens and the Touch pens–both gave me the highest reading of HCHO 1.999 and TVOC 9.999 and SERIOUS POLLUTE. The pens are just as bad as the straight alcohol and blending solution. The Copic pen is worse than the refill, even though both gave me SERIOUS POLLUTE. When I posted the above article in different AI groups, there were quite a lot of of concerned or thankful replies from other artists. I was glad, as I hate to see our beloved alcohol inks harm anyone! Many hadn’t noticed any negative effect yet, but agreed that they needed protection so it wouldn’t happen down the line. There were also several testimonies that AI had, in fact, been harming them. They included headaches, dizziness, coughing, breathlessness, other respiratory issues, and nausea…and two people outright felt like it caused bronchitis. Of course, these are simply anecdotes, but there is reason to be suspicious when you read all the warnings about “inhaling toxic fumes”. I was even removed from one of the AI groups for posting about all I discovered, so I’ll hope that those members are in the other groups and read about all this. We all love our alcohol inks, and it’s clear to me and others that protection is important.